The sacred spot where the mosque was built provided a place of divine worship for over three millennia. The Aramean king Hazael, who had taken power in 805 B.C., built a sumptuous temple for “Hadad Rimmon”, the pagan god of rain and thunder. This became one of the greatest Syrian temples, until it was savagely destroyed by the Assyrian king Tiglet Pilaser in 732 B.C. In the aftermath of the Roman conquest of Syria in 64 B.C., led by Pompeius, the temple was converted to serve Jupiter (another configuration of Hadad and Zeus), and ancient vestiges of this, such as the southern gate and parts of the outer sanctuary (the Peribolos), still remain today. Later on, during the apogee of Christianity in Europe, the Roman Emperor Theodosius I (379-395 A.D.) converted the extant temple into an imposing church, devoting it to St. John the Baptist; the building of this was completed by his son Arcadius (395-408 A.D.). Muslim troops conquered Syria, under the leadership of the famed Khaled b. Al-Walid, in 634 A.D., meeting only with scattered and helpless resistance on the Byzantine side. Soon, in 635, Damascus became a Muslim city. During the next 72 years, the inhabitants of the town, Muslims and Christians alike, shared the holy site as a combined temple, comprising a mosque and a church next to one another. Later, the Caliph Al-Walid bagave orders for a great monumental mosque to be erected. Al-Walid’s work began in 705 A.D. He used the ancient inner wall of the Temenos, as the framework for his new building, with a slight enlargement to the west. A host of the highest-level workers, architects and artists was brought over from Persia, India and Byzantium, as well as large quantities of the finest working materials, such as marble, mosaics, gold, silver and rare paints. 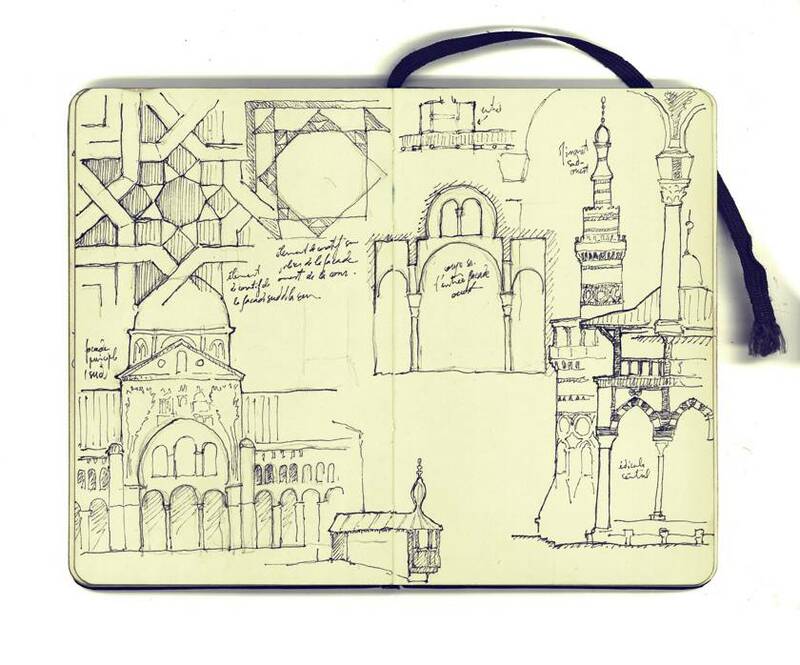 The Great Mosque of Damascus founded the original principles with its innovated concepts. For it was the first mosque in Islamic history to feature such luxury and large size. Although this depended to a certain extent on ancient Syrian patterns, the touch of Muslim workmanship was still evident. Its rise marked the emergence of an independent style of architecture and decorative art, helping thus to embody a new personality with a firm identity. 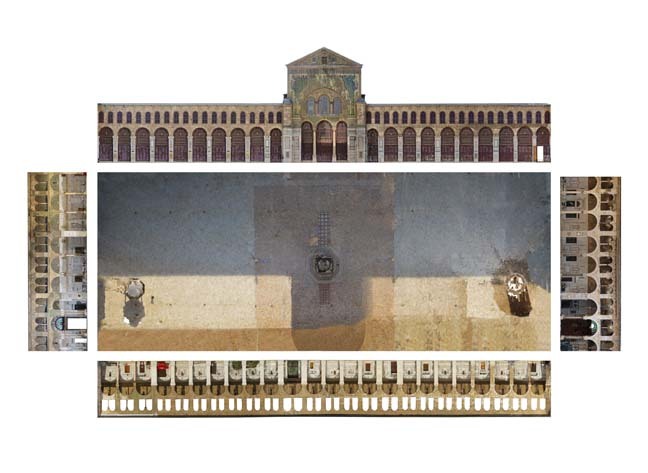 Akili (T.), 2009 : The Great Mosque of Damascus. From Roman Temple to Monument of Islam, Damas, Municipal administration, Modernisation program. Creswell, (K A C.), 1932 : Early Muslim Architecture, I, Oxford, Clarendon Press. Degeorge (G.), La Grande Mosquée des Omeyyades – Damas, Imprimerie nationale, Paris, 2010. Dickie (A C.), Archibald Campbell, 1897 : « The Great Mosque of the Omeiyades, Damascus », Palestine Exploration Fund Quarterly Statement, Londres, p. 268-282. Finster (B. ), « Die Mosaiken der Umayyadenmoschee von Damaskus », Kunst des Orients, 7, 1970-1971, p. 83-141. Gibb (H.), « Arab-Byzantine Relation under the Umayyad Caliphate », Dumbarton Oaks Papers, 11, 1958, p. 219-233. Grabar (O. ), « Islamic Art and Byzantium », Dumbarton Oaks Papers, 18, 1964, p. 69-88. Grabar (O. ), The Formation of Islamic Art, New Haven, Londres, 1987, Yale University Press. Munaǧǧid (S.), Masǧid Dimašq, Damas, al-Maṭbaʿa al-hašimiyya, 1948. Riḥāwī (A. ), Ǧāmiʿ Dimašq al-Umawī al-Tārīḫ wa-l-Turāṯ wa-l-fann al-miʿamārī, Damas, s.n, 1996. Sauvaget (J. ), Les monuments historiques de Damas, Beyrouth, Imprimerie catholique, 1932. 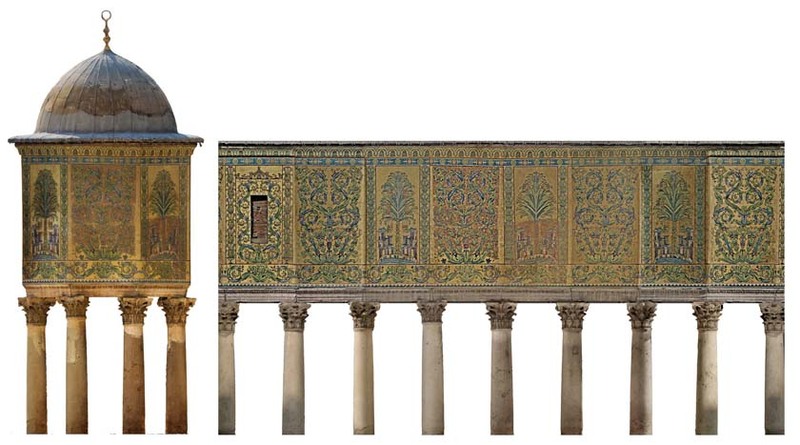 Simonis (L.), Les Relevés des mosaïques de la grande mosquée de Damas, Paris, Coédition musée du Louvre / Somogy éditions d’Art,‎ 2012. Spiers, (R P.), « The Great Mosque of the Omeiyades, Damascus », Palestine Exploration Fund Quarterly Statement 29/4, 1897, p. 282-301. Van Berchem (G.), M., « The Mosaics of the Dome of the Rock in Jerusalem and of the Great Mosque in Damascus », in Creswell, K. A. C., Early Muslim Architecture, vol.I, part.1, Oxford, 1969, Clarendon Press, p. 212-372. Vigouroux (E.), “La Mosquée des Omeyyades de Damas après Tamerlan”, Damas médiévale et ottomane. Histoire urbaine, société et culture matérielle, Tome LXI, 2012, p. 123-159. Watzinger (C.) & Wulzinger (K.), Damaskus die Islamische Stadt, Berlin/Leipzig, Walter de Gruyter & co, 1924. Ibn Ṣaṣrā, al-Durra al-muḍī’a fī l-Dawla al-Ẓāhiriya, éd. et trad. William Brinner, Berkeley, University of California, 2 vol., 1963. ʿUmarī (al-), Masālik al-abṣār fī mamālik al-amṣār, éd. Ayman Fu’ad Sayyid, Le Caire, Institut français d’archéologie orientale, 1985. Bravo pour ce magnifique projet. Qu’il y ait partout des hommes de paix et de culture. Merveilleux. Merci pour ce projet culturel spectaculaire.